Acropolis of Lindos and the picturesque authentic village of Lindos below the acropolis is an absolute must-see when you visit Rhodes. Located 45 km away from Rhodes town, in a wonderful private golf with fabulous sandy beaches, Lindos is a charming place with cobblestone streets and white houses leaning towards the sea. Wonder around the streets where the locals will warmly greet you or if you feel bored of walking just hire a donkey to do the donkey work for you! The cosmopolitan atmosphere here is unique with a plethora of options to make your day whether you are after top class beaches, water sports, bars or cafes with panoramic views, quality restaurants or even a lively nightlife stretching to the early hours of the morning. 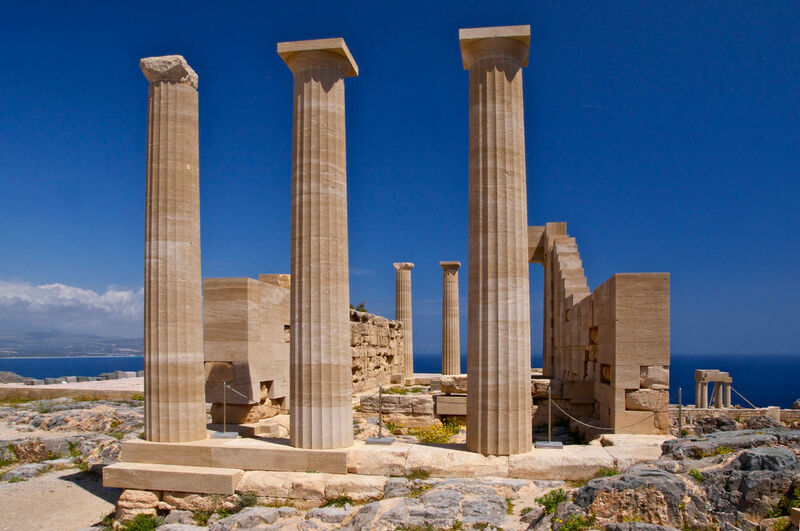 Lindos however is not just a famous holiday resort it is also a place of great historical interest. Whether you decide to take a flight of steps yourself or give a try to the donkey ride to ascend on the Acropolis this is something worth seeing from both an archeological perspective as well as for the stunning views offered. The Acropolis does not initially betray its Hellenistic origins because it has been surrounded by a strong fortification in the Middle Ages by the Knights of St John that used to occupy the island. However once you are inside you will be able to admire the propylaean ruins, the sanctuary of Athena, the Byzantine church of St John and the ruins of an ancient theatre situated on the slope below the Acropolis. And if you are not interested in all this just have your camera ready to capture perhaps one of the best sceneries you will ever see in your life!